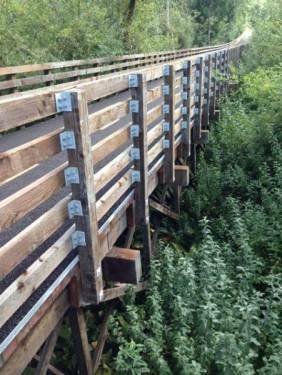 In August 2014 Portland Bolt provided fasteners for the expansion of the Cushman Trail Project. The project was initially designed in 2008 by Pierce County, but the City of Gig Harbor completed the design for the trail in 2013. The trail is 6.2 miles long and it begins at 14th Avenue, which is south of the Gig Harbor city limits. It is specifically for non-motorized activity with a 12’-16’ wide pervious pavement trail and boasts 5 different public restrooms and onsite parking locations. The trail weaves through areas with natural and dramatic scenery with flat slopes and inclines up to 10%. Along with natural scenery comes a great opportunity to view wildlife along with stunning views of Gig Harbor. Phase 3 of the project extended the Cushman Trail from 96th Street to Burnham Drive. The trail previously ended at 96th Street, but with the 1,300 ft. long pin-pile bridge, it now connects the trail to the natural surroundings beyond 96th Street. Phase 4 of the project extended the trail past Burnham Drive through part of McCormick Creek Plat, offering more stunning scenery through the wetlands. Because the trail runs through marshlands that are protected by the government, along with government grants which provided the necessary funding, this project required 100% domestic materials. All of the hardware was provided with full certification documents, making it easy for the general contractor to submit their package for approval to the city. The wooden railings and pin-pile bridge required custom headed hex bolts and lag bolts which were right up Portland Bolt’s alley. Because all of the hardware is exposed to the outside elements, it all had to be hot-dip galvanized. Thanks to our in-house, hot-dip galvanizing line, Portland Bolt was able to manufacture these from start to finish all here in our 94,000 square foot manufacturing facility. With more than 23,000 bolts manufactured on this project, Portland Bolt was able to manufacture and ship the entire order in less than a month, with the first half of the order shipping in just 2 weeks, fitting the contractor’s tight schedule. Do you have a project that requires 100% domestic, galvanized materials? Give Portland Bolt a call and let us meet your next delivery schedule!